MIDDLETOWN, NY. - Roy Thompson is living the American dream. 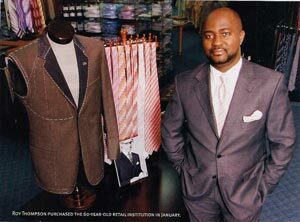 A native Jamaican, Thompson was trained in the British art of tailoring and came to the u.s. in 1999 to seek his fortune. After stints at Nordstrom, Neiman Marcus and Macy's in White Plains, where he managed the tailor shop, four years ago he joined Foeller Men's Store, a Middletown, N.Y., institution, as its master tailor. "I live in the area and was looking for opportunities," he recalled. "I applied for a job here, but it took three months before they called." In the beginning, Thompson would bring the suits and sport coats that needed tailoring to his home and take them back when they were completed. His hard work paid off, and it didn't take long for him to develop a following. The situation changed dramatically in January, when Keith Moulton, then owner of Foeller's, informed Thompson that he was ready to retire from the store that had clothed men in Orange County since 1945. After advertising his intent to sell the business, Moulton was unsuccessful in finding a viable purchaser. He was preparing to close the doors when Thompson stepped up to the plate to buy the business. "It was really a leap of faith," he said. "Who wants to buy a men's store today?" But he knew that Foeller's had carved out a niche in the community over the past 60 years, particularly among the big & tall customer. "We carry sizes 36 to 74 and cater to men of all sizes," Thompson said. "This is a hands-on business, and you almost have to be a tailor to make it work." In fact, a brochure for the business states, "We carry clothing to fit almost every man. Special cuts are available jOrthe man who is not accommodated by an 'off-the-rack' purchase. Slacks are stocked to size 70 and sportswear in medium to 6X, large tall to 6XLT." No matter their size, Thompson is clear on one thing: "I like to see men dressed up and looking nice-that's my passion." It was a passion born at a young age: Thompson's mother and cousins were dressmakers, and his uncle was a tailor, so it came as no surprise that at age 12 this was the career path he chose. He entered a tailoring school in Jamaica in 1980 to learn "the British way of doing things" and worked hard to learn the ropes. He described it as "a long-suffering journey. We would spend weeks just getting the buttonholes perfect. But it taught me the clothing business and how to hang on until it's complete." That's the same thing he intends to do with Foeller's. By combining his tailoring expertise with the customer-service experience he acquired at Neiman's and Nordstrom, Thompson believes he has a winning formula. "I was awarded an Art of Selling certificate at Neiman Marcus," he said proudly, "and I learned to relate to the customer at Nordstrom." Added to the management experience he received at Macy's, Thompson observed, "it sums up to owning my own company." Although he admits that some of his customers haven't worn a suit in 30 years, when they do need to dress up for a wedding, job interview or other special occasion they turn to Foeller's. "They need somebody to dress them, at' that's what led me to take this road," he said. The average suit price is around 0, and it can go up to 0 or 0. His mix tops out at Tallia, and the store also carries Petrocelli, Hartwick and Pat Beach. He also offers made-to-measure suits from Tallia for ,200 to ,500 and is hoping to add Perry Ellis to his selection. In shirts, the store carries Enro made-to-measure merchandise and would like to add Ike Behar, but the neck sizes "go up to only 18 inches, and we need them to be 20 to 22 inches," Thompson said. In sportswear, he looks for vendors that are not widely distributed, such as After Dark, Cotton Reel, Rick's Cafe, Falcon Bay and MBX. Slacks are from Wrangler, Greystone, Sansabelt, Palm Beach and Dreams. Foeller's also carries a smattering of men's colognes, and such novelty items as socks that don't have elastic bands for people with diabetes. The store is nearly 70 percent clothing and furnishings, although the sports wear merchandise is displayed at the front of the store to attract traffic. "We cart sportswear, but we make all our money on suits and furnishings, not jeans he said. "A guy will come in for a suit and then add on a shirt, tie and slacks. That's the better part of the business." In the eight months since he bought the business, Thompson said he has "managed to wake up quite a few customers, and the response has been great" He had a successful prom season, during which the store rented scores of tuxedos to local students. "This is one of the oldest tuxedo-rental businesses in the area," he said. some radio ads. "But a lot of it is word-of-mouth," he said. There are very few men's retailers left in the Middletown market, as the city has seen some venerable names disappear from the landscape, such as Green's Department Store and Kassel Bros. Foeller's is arguably the last holdout. In the nearby Galleria Crystal Run mall, there is a J.C. Penney, Filene's (soon to be Macy's), Sears and Christopher's, but they serve a different customer, Thompson said. "If a guy wants nice-fitting clothes that will stand up at the cleaners, he will come to Foeller's," he said. "I can educate him about fine clothing and how it is made." And with his tailoring background, special circumstances are no problem. "One of our customers is a bodybuilder, and when we fitted him in a suit we took the jacket pockets off, altered the suit and then sewed them back on. You won't find that in a department store. We do real serious alterations." Although he now owns the business, Thompson is still the primary tailor-as well as salesman, buyer and bookkeeper. He has some help a couple of days a week, but pretty much spends every day on the sales floor. "I have to be here, people buying a suit still want a heart-to-heart." He has attended B.A.T.M.A.N. and the Men's Apparel Club of New York show at Russo's Howard Beach and would like to attend MAG I if he can pry himself away from the store. "I have help, but they don't understand the business, said. "So I'm here seven days a week." One of the people he leans on is John Dino, spent 20 years at Kassels but is now retired; works only a limited number of hours at Foellers Dino called Thompson "an excellent tailor all top notch salesman." For Thompson, it's all in a day's work. "Will you come to Foeller's, you don't leave until we've fit you properly. 'A satisfied customer' is our motto.